The Climate Change Crowd Just Can't Get Enough, Can They? The Climate Change Crowd Just Can’t Get Enough, Can They? Editor’s Note: this post originally appeared as exclusive content at The Mighty Hayride earlier this week. You don’t know what The Mighty Hayride is? You should join and find out! 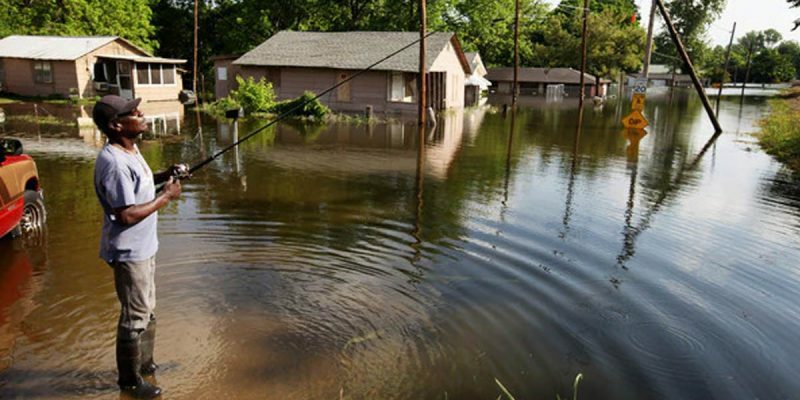 Flood control work in the Mississippi River and its tributaries has likely made floods worse in Louisiana and Mississippi, researchers say. Using 500 years of data from tree rings and sediment in oxbow lakes—bends that once were part of the Mississippi River but became lakes after the river changed its path—researchers say the river has flooded more often and poured more water into these states over the past 150 years than any previous period. Climate change may be responsible for about one-quarter of the difference, they estimate. Engineering—like building levees and creating a straighter, more narrow channel for navigation—is likely responsible for the rest, researchers from Massachusetts, Illinois, Alabama, South Carolina, Texas and Liverpool, England, say in today’s journal Nature. Some outside scientists praise the paper, while others are casting doubts about the conclusion that flood engineering is the main reason floods are worse in Louisiana and Mississippi. Upmanu Lall, director of the Columbia Water Center at Columbia University, says the work linking “floodiness” to climate cycles over five centuries is exciting, but the argument about river engineering as the main driver is weak. Recent floods have included some very low and very high floods, Lall says. Small floods also probably didn’t leave sediment or tree ring records. The recent flood analysis also doesn’t include any analysis of likely causes and ignores whether increased rainfall or changes in the landscape, such as Midwestern farm drainage, might be among them, he says. Got that? The professor from Columbia, whose Water Center team is staffed through and through with people invested in climate change, isn’t satisfied with the contention that it’s poor design of flood control structures which have made the lower Mississippi river delta more vulnerable to flooding. Everybody in Louisiana, or at least everybody who’s willing to go where the facts lead them, knows that the leveeing of the Mississippi to its mouth has had deleterious unintended consequences to the land here. Those levees have denied sediment to the coastal marshes, for one thing – but it’s more than that. The “dry” land in the lower river delta is supposed to receive sediment deposits as well in the natural course of things; by preventing the spring floods the “dry” land doesn’t get replenished, and it will naturally sink. Which it does. New Orleans is absolutely sinking. But that’s not where the grants are. The grants are in climate change. So when somebody does a study noting that by keeping the Mississippi from occasionally flooding its delta (and don’t make the mistake of thinking we’re for blowing up the leveess and inundating your house each spring; that’s not what we’re saying – we’re just saying there’s a price to be paid for what the U.S. Army Corps of Engineers has done) man has opened up that land to flooding from other sources, the climate change activists go ballistic. After all, they don’t want anybody flooding their rice bowl.